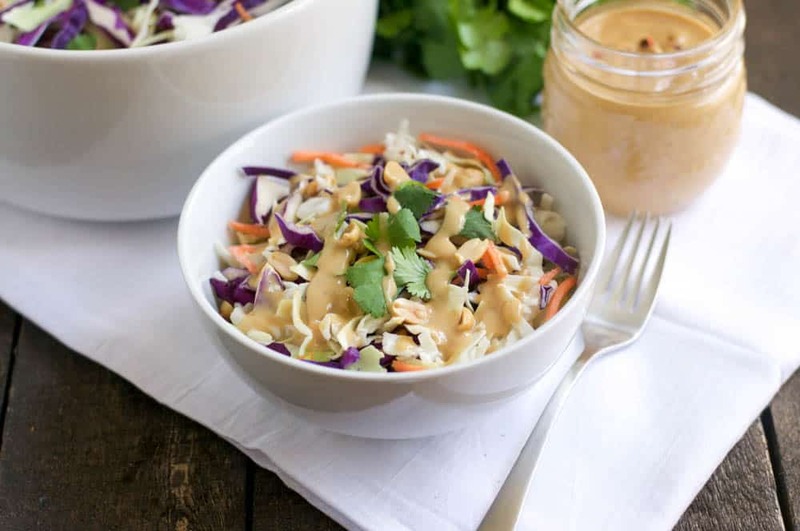 There is a Thai restaurant in town that serves an amazing cabbage salad with a peanut dressing that I have to get every time I go there. Recently I drove past the restaurant and realized it had been a while since I had been there and of course a craving for the salad ensued. 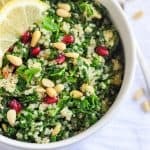 I decided I would give this recipe a spin and come up with my own version. It’s definitely not the same, but it sure is tasty! I happen to be a big fan of cabbage. The crunch, the sweet and sour flavor all at once, and then there are the nutrition benefits. I typically will add chopped cabbage to my salads several times a week. Raw cabbage has been noted to be a great cancer preventer. Cabbage is high in vitamin K so if your brain is need of a mental boost, nosh on a bit of napa and things should start clicking! If you are ever on Pinterest searching for cabbage salads (please tell me I am not the only one who does this! Please?! 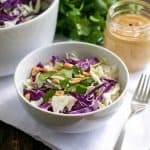 ), they are often called ‘Detox Salads.” This is because cabbage is a great detoxifier of the body due to its high content of Vitamin C and sulphur. If all of that doesn’t make you love cabbage, then maybe the fact that it is an ancient hangover remedy used all the way back in the time of the Romans will have you adding it to your diet! Read more here. This Chopped Thai Salad is a great base salad that can be tweaked by a variety of add ins. I kept the recipe very basic so that each time you make it, you can fine tune it with the possible addition of grilled chicken, avocado, edamame, yellow pepper and more. 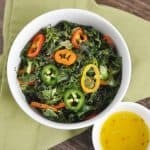 If you are going to serve it to a group for a party or cookout, toss the dressing in the entire salad when serving. If you are planning to eat off of it over a week like I did, leave the dressing separate until you are ready to eat. The peanut dressing is somewhat thick but the addition of a bit more water can bring it to your desired consistency. Also, I am a firm believer that there is no such thing as too much cilantro so pile on as much as you like! Enjoy! Chop/cut vegetables accordingly and combine in a large mixing bowl. Toss to combine. For the dressing, whisk all ingredients together in a small mixing bowl. Either pour dressing over salad and toss to combine, or wait until ready to serve to add dressing. Refrigerate leftovers in sealed containers. Lots of options to jazz up this salad: add grilled chicken, cubed avocado, throw on some shelled edamame, or toss in some yellow peppers. The possibilities are endless!